No other brewery in America can claim the number of “firsts” that are part of the brewing heritage here at Anchor Brewing Company. To celebrate our history of innovation, we’ve created the Craft Originals 12-pack, a collection of America’s first craft-brewed beers. Each Craft Originals 12-pack features four legendary brews together in one package for the first time: Anchor Steam® Beer, Anchor Porter®, Liberty Ale®, and Original Wheat™. 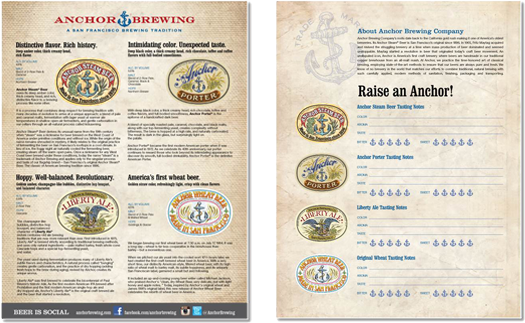 An Anchor Craft Originals Educational and Tasting Notes Sheet is also included in each 12-pack, created to help the craft beer enthusiast understand the historical significance of these brews while documenting the aroma, color and flavors of each of them. We recently sat down with Anchor brewmaster Mark Carpenter to get his thoughts on being present for the first brewing of each of these beers, with the exception of Anchor Steam of course, and invited Mark to share his insights into the Anchor world of firsts. Mark: Anchor Steam Beer, to me, is truly one of the world’s great beers. Everything about it stands out on its own. From the process, to the open fermentation, to the unique color and distinctive flavor, our flagship beer is one I hope others can really enjoy. Over the years people have accused us of changing the recipe, trying to make it lighter or this and that, but it’s not true and I’m proud to say it’s still the same as when I arrived and is still one of my all-time favorites. Three additional beers complete the collection. Anchor Porter (5.6% ABV) is the definitive brew that became the first modern American porter when it was introduced in 1972. Those who look beyond its intimidating color discover its surprisingly smooth, full-bodied drinkability. Mark: Anchor Porter was the very first beer, other than Anchor Steam, we made in the brewhouse, making it a monumental assignment when we started and a huge accomplishment once the final product was in our hands and we had satisfied our goal to create a traditional, hand-made dark beer. At the time when Fritz took over the brewery there were two Anchor Steam options, Anchor Steam that we know, brew and drink today, and also Anchor Steam Dark. Steam Dark was only on draught and at the time it was Anchor Steam Beer with caramel coloring added. This was something we inherited and wasn’t true to our style, even though, at the time, most dark beers available were just that, light to medium bodied beers with additives to give the appearance and faux taste of a dark beer. We wanted to change that and set out to create a true, traditional dark beer. Through recipe research and a little trial and error, the Anchor Porter in your hand today is the one we first brewed back in 1972. It also was the first time black malt had ever entered the brewery, another Anchor first. Now we use a combination of pale, caramel, chocolate and black malts, and that’s how Anchor Porter was born. The beer that started the IPA revolution, Liberty Ale (5.9% ABV) was introduced in 1975, well before it was fashionable to call a craft-brewed, hop-forward pale ale an IPA. Liberty Ale’s introduction of the Cascade hop and the revival of the dry hopping technique revolutionized American brewing. Mark: In 1974 Fritz and I took a trip to England to get inspiration and had the chance to taste and experience a lot of interesting real ales. Real ales being cask ale or cask-conditioned beer that is unfiltered and unpasteurized and then conditioned (including secondary fermentation) and served from a cask without additional nitrogen or carbon dioxide pressure. The term cask ale is often interchanged with real ale. While in England we had some real ales with nice hop character, prompting Fritz to make a hoppy, flavorful ale upon returning to the brewhouse in Potrero Hill. When it was brewed and people tasted it, the feedback was that we overdid it. “Too hoppy,” they said. “People don’t want to drink beer with this kind of flavor and profile,” we were told. It’s funny to have been sitting there and hearing that and then looking at today’s landscape of the arms race to the hop bombs we see in the craft beer scene today. Our Liberty Ale is the same today as it was then. One thing we didn’t account for was the unforeseen rise of hop profile that people now crave. I think our Liberty Ale is superbly balanced ale between our pale malt and Cascade hops. The first of a new generation of wheat beers in the U.S., Original Wheat (5.6%) was introduced in 1984. Exclusively available in the Anchor Craft Originals 12-pack, this unique re-creation celebrates the rebirth of wheat beer in America. Mark: Original Wheat was a really fun challenge for us because the use of wheat had interested us in the past, but we had yet to create something in the brewhouse. Up to this point we had created our full-flavored, highly-hopped ale and wanted to make something light, but not a lager. So we looked around the world for other light beer types to see what interested us and what we felt we wanted to take on and impart our own Anchor style to. One that we gravitated toward was the popular German-style wheat beers. We didn’t want to re-create this type of beer, but we liked the idea of using wheat, so that was the start of how we developed our Original Wheat Beer. The best part about bringing this beer back to life [for the Anchor Craft Originals 12-pack] was, when I tasted it for the first time in our cellars, it surprised me how much it tasted like our first rendition back in 1984. The wheat flavor really came through and we’re excited for it to be part of this pack. 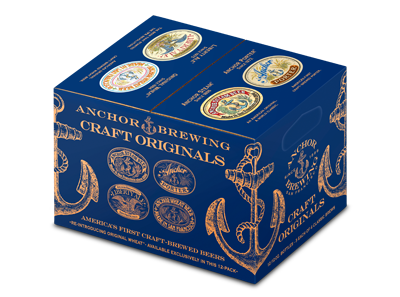 The Anchor Craft Originals 12-pack will be available at select retailers nationwide beginning September 2013. Share your tasting notes with us on Facebook, Twitter, or Google+. Cheers!